The beauty of the Branson hills convinced Jeff and Carol Lemley to move with their six kids from the Lone Star State to the Show Me State. 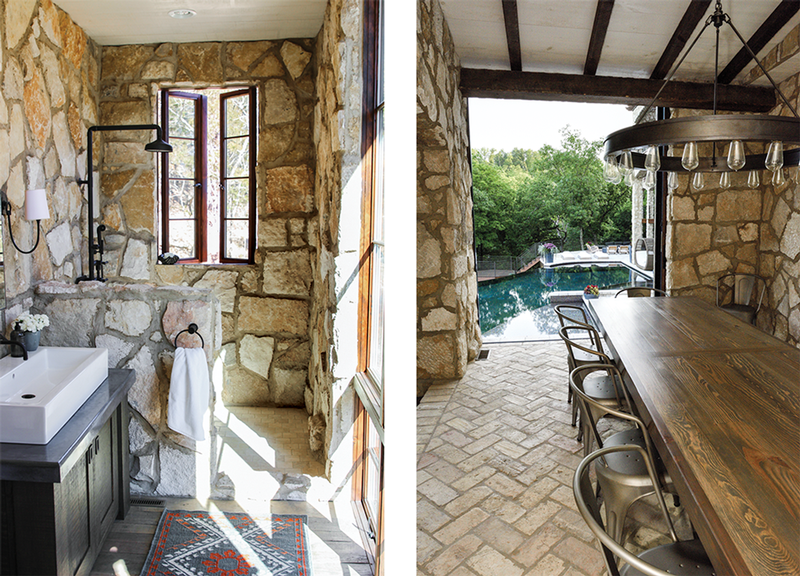 Now, the pool house adjacent to their home on Lake Taneycomo is a year-round gathering spot. When Texas natives Jeff and Carol Lemley made their first trip to Missouri, they were picking up their oldest daughter from Kanakuk summer camp in Branson. 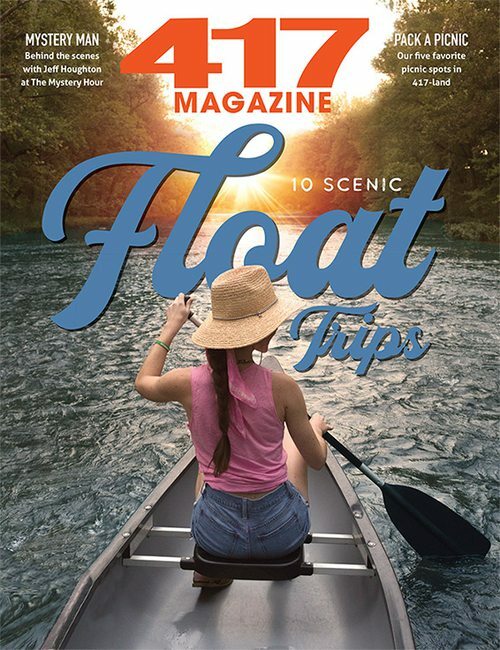 Instead of driving down the Highway 76 strip like most visitors, they took a scenic, winding path through the Ozark hills, and the family was left with a lasting impression of the quiet, peaceful landscape. 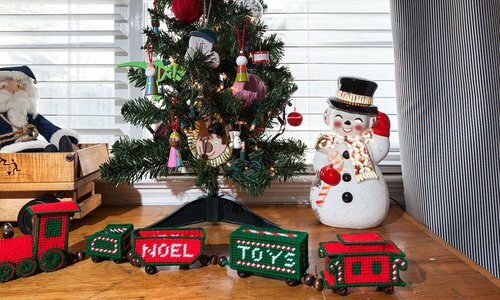 In the years that followed, as their six children all began attending different camp sessions, the couple started staying local instead of making the seven-hour drive back and forth. 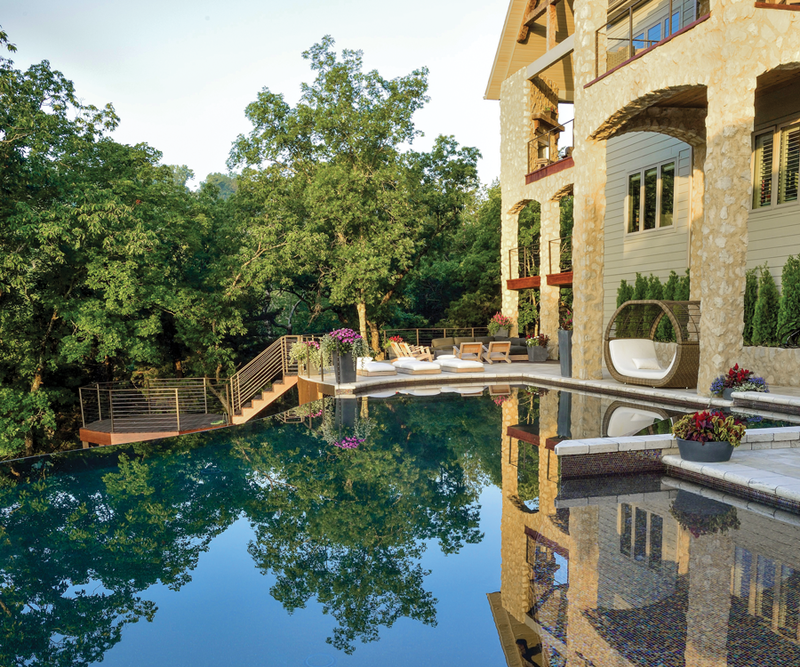 In 2008, the couple purchased a three-acre plot in a private cove on Lake Taneycomo and began building what they thought would be a summer home, perfect for relaxing during the camp season. By 2013, they had fallen in love with the lifestyle and decided to stay for good. 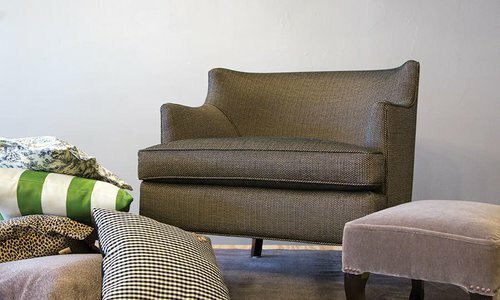 As permanent Branson residents, the couple made their first order of business expanding their modest home to make it spacious and comfortable enough for year-round living. The Lemleys called on builder Ty Cofer of Petra Homes to complete renovations in three stages, including a must-have pool house that seriously ups the property’s wow factor. 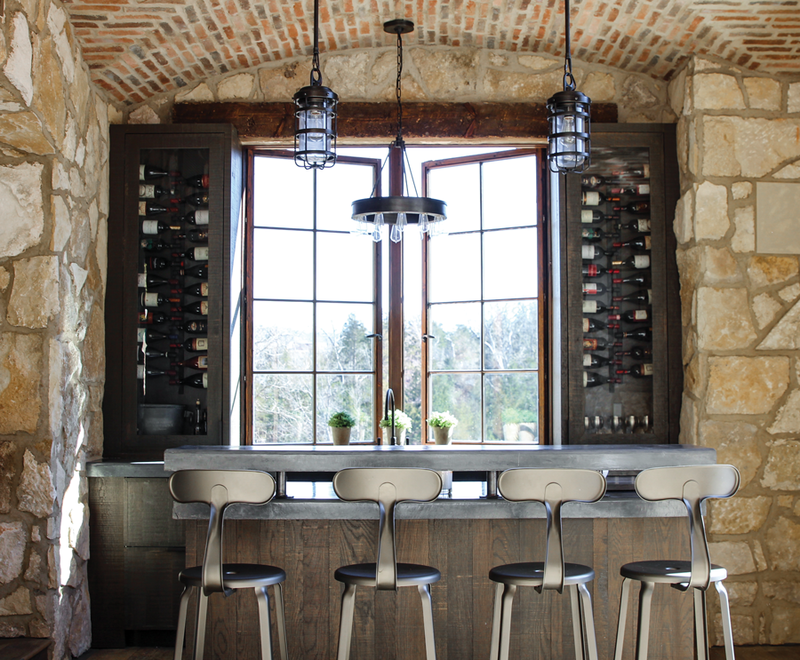 The Texas-based interior design firm Lindsay Todd Design took care of the rest, bringing the Lemleys’ vision for an industrial-inspired Tuscan farmhouse to life. 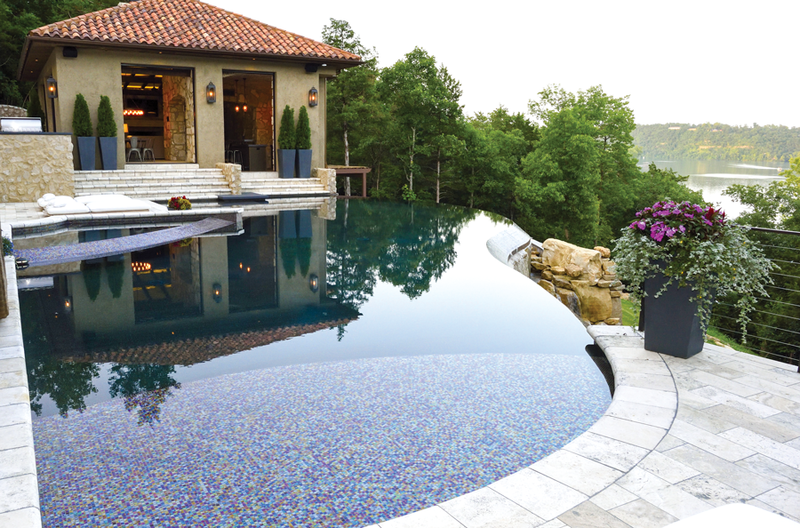 The Lemleys’ pool has an infinity edge version that uses a natural sanitizer called ozone to keep the water bacteria-free. In the pool and corner hot tub, tiny glass tiles in shades of purple and red draw the eye to similarly colored flower blooms and up to the terracotta roof of the main hangout—the pool house. The pool house living room is a popular spot to kick back when the sun’s rays become too much (and in the off season when Cardinals baseball is on TV). But since everyone is usually in wet bathing suits, water-resistant fabric was a must. Perhaps no other room in the pool house distinctly replicates Italian style more than the kitchen, where raw materials and warm tones mesh to create a cozy area for cooking and eating. A butterfly ceiling with brick pavers begs a glance almost more than the beautiful picture window that makes washing dishes less of a chore. Left: The Tuscan farmhouse–inspired getaway includes this bathroom, designed to bring the outdoors in with floor-to-ceiling windows. Contemporary touches like the vessel sink balance with rustic elements elsewhere. Right: With three kids in college and three younger ones at home, summer is a reunion time for the Lemleys. Reclaimed oak was used to build this table that seats 10. Customized stain matches the kitchen and bathroom floors, as well as a 50-inch ring chandelier from Ralph Lauren, and steel seating reinforces the industrial vibe. 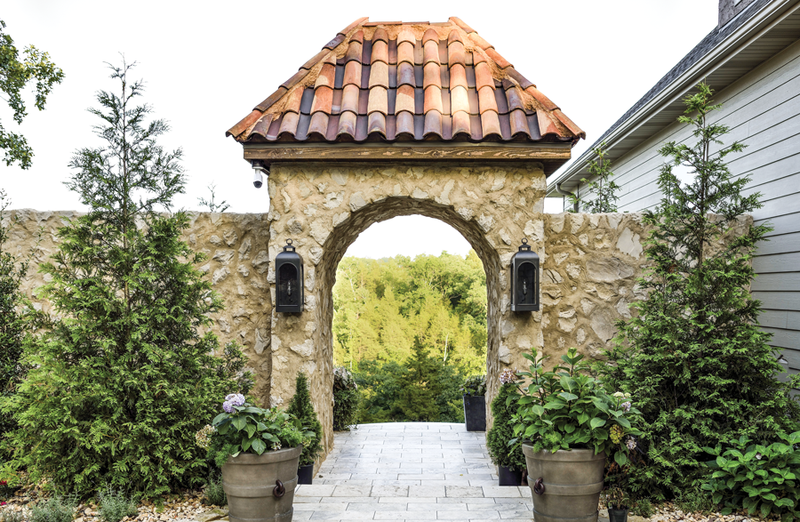 When not heading to the pool from inside the main house, guests enter at the top of the driveway through this immense archway designed with form and function in mind. "We wanted a grand entrance with a surprise element,” Carol says. Symmetrical landscaping and Restoration Hardware lighting create balance and an aesthetically pleasing look. 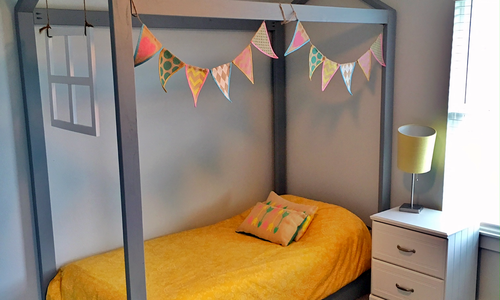 These pint-size bed frames made by 417-lander Matt Grandt give bedtime an upgrade.